Muhsin Khan Indeed Allah has heard the statement of her (Khaulah bint Tha'labah) that disputes with you (O Muhammad SAW) concerning her husband (Aus bin As-Samit), and complains to Allah. And Allah hears the argument between you both. Verily, Allah is All-Hearer, All-Seer. Pickthall Allah hath heard the saying of her that disputeth with thee (Muhammad) concerning her husband, and complaineth unto Allah. And Allah heareth your colloquy. Lo! Allah is Hearer, Knower. Muhsin Khan Those among you who make their wives unlawful (Az-Zihar) to them by saying to them "You are like my mother's back." They cannot be their mothers. None can be their mothers except those who gave them birth. And verily, they utter an ill word and a lie. And verily, Allah is Oft-Pardoning, Oft-Forgiving. Pickthall Such of you as put away your wives (by saying they are as their mothers) - They are not their mothers; none are their mothers except those who gave them birth - they indeed utter an ill word and a lie. And lo! Allah is Forgiving, Merciful. Muhsin Khan And those who make unlawful to them (their wives) (by Az-Zihar) and wish to free themselves from what they uttered, (the penalty) in that case (is) the freeing of a slave before they touch each other. That is an admonition to you (so that you may not return to such an ill thing). And Allah is All-Aware of what you do. Pickthall Those who put away their wives (by saying they are as their mothers) and afterward would go back on that which they have said, (the penalty) in that case (is) the freeing of a slave before they touch one another. 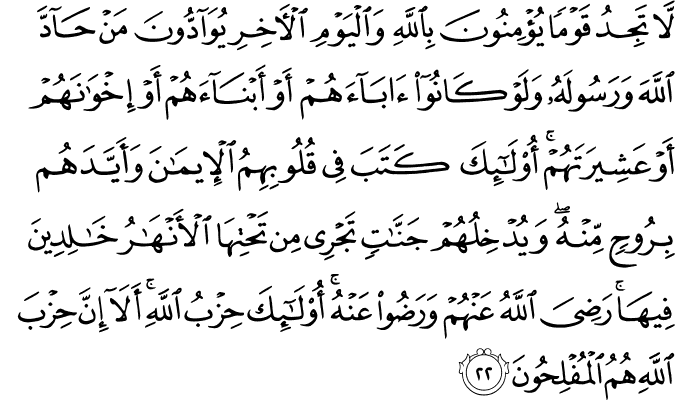 Unto this ye are exhorted; and Allah is Informed of what ye do. Muhsin Khan And he who finds not (the money for freeing a slave) must fast two successive months before they both touch each other. And for him who is unable to do so, he should feed sixty of Miskin (poor). That is in order that you may have perfect Faith in Allah and His Messenger. These are the limits set by Allah. And for disbelievers, there is a painful torment. Pickthall And he who findeth not (the wherewithal), let him fast for two successive months before they touch one another; and for him who is unable to do so (the penance is) the feeding of sixty needy ones. This, that ye may put trust in Allah and His messenger. Such are the limits (imposed by Allah); and for disbelievers is a painful doom. Muhsin Khan Verily, those who oppose Allah and His Messenger (Muhammad SAW) will be disgraced, as those before them (among the past nation), were disgraced. And We have sent down clear Ayat (proofs, evidences, verses, lessons, signs, revelations, etc.). And for the disbelievers is a disgracing torment. Muhsin Khan On the Day when Allah will resurrect them all together (i.e. the Day of Resurrection) and inform them of what they did. Allah has kept account of it, while they have forgotten it. And Allah is Witness over all things. Pickthall On the day when Allah will raise them all together and inform them of what they did. Allah hath kept account of it while they forgot it. And Allah is Witness over all things. Muhsin Khan Have you not seen that Allah knows whatsoever is in the heavens and whatsoever is on the earth? There is no Najwa (secret counsel) of three, but He is their fourth (with His Knowledge, while He Himself is over the Throne, over the seventh heaven), nor of five but He is their sixth (with His Knowledge), not of less than that or more, but He is with them (with His Knowledge) wheresoever they may be; and afterwards on the Day of Resurrection, He will inform them of what they did. Verily, Allah is the All-Knower of everything. Pickthall Hast thou not seen that Allah knoweth all that is in the heavens and all that is in the earth? There is no secret conference of three but He is their fourth, nor of five but He is their sixth, nor of less than that or more but He is with them wheresoever they may be; and afterward, on the Day of Resurrection, He will inform them of what they did. Lo! Allah is Knower of all things. Muhsin Khan Have you not seen those who were forbidden to hold secret counsels, and afterwards returned to that which they had been forbidden, and conspired together for sin and wrong doing and disobedience to the Messenger (Muhammad SAW ). And when they come to you, they greet you with a greeting wherewith Allah greets you not, and say within themselves: "Why should Allah punish us not for what we say?" Hell will be sufficient for them, they will burn therein, and worst indeed is that destination! Pickthall Hast thou not observed those who were forbidden conspiracy and afterward returned to that which they had been forbidden, and (now) conspire together for crime and wrongdoing and disobedience toward the messenger? And when they come unto thee they greet thee with a greeting wherewith Allah greeteth thee not, and say within themselves: Why should Allah punish us for what we say? Hell will suffice them; they will feel the heat thereof - a hapless journey's end! Muhsin Khan O you who believe! When you hold secret counsel, do it not for sin and wrong-doing, and disobedience towards the Messenger (Muhammad SAW) but do it for Al-Birr (righteousness) and Taqwa (virtues and piety); and fear Allah unto Whom you shall be gathered. Pickthall O ye who believe! When ye conspire together, conspire not together for crime and wrongdoing and disobedience toward the messenger, but conspire together for righteousness and piety, and keep your duty toward Allah, unto whom ye will be gathered. Muhsin Khan Secret counsels (conspiracies) are only from Shaitan (Satan), in order that he may cause grief to the believers. But he cannot harm them in the least, except as Allah permits, and in Allah let the believers put their trust. Pickthall Lo! Conspiracy is only of the devil, that he may vex those who believe; but he can harm them not at all unless by Allah's leave. In Allah let believers put their trust. Muhsin Khan O you who believe! When you are told to make room in the assemblies, (spread out and) make room. Allah will give you (ample) room (from His Mercy). And when you are told to rise up [for prayers, Jihad (holy fighting in Allah's Cause), or for any other good deed], rise up. Allah will exalt in degree those of you who believe, and those who have been granted knowledge. And Allah is Well-Acquainted with what you do. Pickthall O ye who believe! when it is said unto you, Make room! in assemblies, then make room; Allah will make way for you (hereafter). And when it is said, Come up higher! go up higher; Allah will exalt those who believe among you, and those who have knowledge, to high ranks. Allah is Informed of what ye do. Muhsin Khan O you who believe! When you (want to) consult the Messenger (Muhammad SAW) in private, spend something in charity before your private consultation. That will be better and purer for you. But if you find not (the means for it), then verily, Allah is Oft-Forgiving, Most Merciful. Pickthall O ye who believe! When ye hold conference with the messenger, offer an alms before your conference. That is better and purer for you. But if ye cannot find (the wherewithal) then lo! Allah is Forgiving, Merciful. Muhsin Khan Are you afraid of spending in charity before your private consultation (with him)? If then you do it not, and Allah has forgiven you, then (at least) perform As-Salat (Iqamat-as-Salat) and give Zakat and obey Allah (i.e. do all what Allah and His Prophet SAW order you to do). And Allah is All-Aware of what you do. Pickthall Fear ye to offer alms before your conference? Then, when ye do it not and Allah hath forgiven you, establish worship and pay the poor-due and obey Allah and His messenger. And Allah is Aware of what ye do. Muhsin Khan Have you (O Muhammad SAW) not seen those (hypocrites) who take for friends a people upon whom is the Wrath of Allah (i.e. Jews)? They are neither of you (Muslims) nor of them (Jews), and they swear to a lie while they know. Pickthall Hast thou not seen those who take for friends a folk with whom Allah is wroth? They are neither of you nor of them, and they swear a false oath knowingly. Muhsin Khan Allah has prepared for them a severe torment. Evil indeed is that which they used to do. Pickthall Allah hath prepared for them a dreadful doom. Evil indeed is that which they are wont to do. Muhsin Khan They have made their oaths a screen (for their evil actions). Thus they hinder (men) from the Path of Allah, so they shall have a humiliating torment. Pickthall They make a shelter of their oaths and turn (men) from the way of Allah; so theirs will be a shameful doom. Muhsin Khan Their children and their wealth will avail them nothing against Allah. They will be (the) dwellers of the Fire, to dwell therein forever. Pickthall Their wealth and their children will avail them naught against Allah. Such are rightful owners of the Fire; they will abide therein. Muhsin Khan On the Day when Allah will resurrect them all together (for their account), then they will swear to Him as they swear to you (O Muslims). And they think that they have something (to stand upon). Verily, they are liars! Pickthall On the day when Allah will raise them all together, then will they swear unto Him as they (now) swear unto you, and they will fancy that they have some standing. Lo! is it not they who are the liars? Muhsin Khan Shaitan (Satan) has overtaken them. So he has made them forget the remembrance of Allah. They are the party of Shaitan (Satan). Verily, it is the party of Shaitan (Satan) that will be the losers! Pickthall The devil hath engrossed them and so hath caused them to forget remembrance of Allah. They are the devil's party. Lo! is it not the devil's party who will be the losers? Muhsin Khan Those who oppose Allah and His Messenger (Muhammad SAW), they will be among the lowest (most humiliated). Pickthall Lo! those who oppose Allah and His messenger, they will be among the lowest. Muhsin Khan Allah has decreed: "Verily! It is I and My Messengers who shall be the victorious." Verily, Allah is All-Powerful, All-Mighty. Pickthall Allah hath decreed: Lo! I verily shall conquer,I and My messengers. Lo! Allah is Strong, Almighty. Muhsin Khan You (O Muhammad SAW) will not find any people who believe in Allah and the Last Day, making friendship with those who oppose Allah and His Messenger (Muhammad SAW ), even though they were their fathers, or their sons, or their brothers, or their kindred (people). For such He has written Faith in their hearts, and strengthened them with Ruh (proofs, light and true guidance) from Himself. And We will admit them to Gardens (Paradise) under which rivers flow, to dwell therein (forever). Allah is pleased with them, and they with Him. They are the Party of Allah. Verily, it is the Party of Allah that will be the successful. Pickthall Thou wilt not find folk who believe in Allah and the Last Day loving those who oppose Allah and His messenger, even though they be their fathers or their sons or their brethren or their clan. As for such, He hath written faith upon their hearts and hath strengthened them with a Spirit from Him, and He will bring them into Gardens underneath which rivers flow, wherein they will abide. Allah is well pleased with them, and they are well pleased with Him. They are Allah's party. Lo! is it not Allah's party who are the successful?